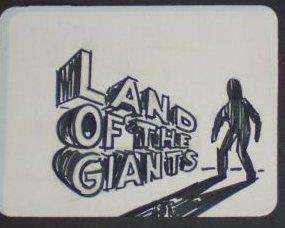 Vintage "Land of the Giants" Preproduction Title Matte, 20th Century Fox Film Corp. Large 22"x17" matted cardboard. 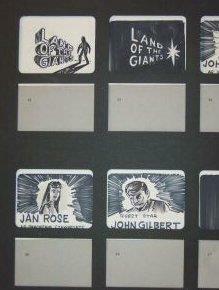 Believed to be test work-up for the title sequence for the show, before the first season, and perhaps even before final casting decisions were made (as the names and characters seem to be just place holders). As you probably know, production design pieces from old TV shows are almost impossible to come across... the original owner found this gem at a flea market in Hollywood some years back, and boy, did his eyes pop when I saw it!